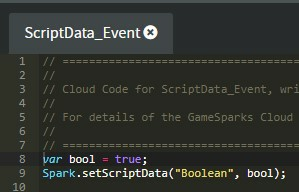 Some of our Unity users can have issues with script Data in Unity. 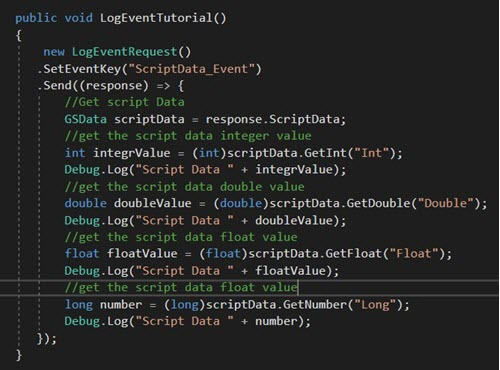 This tutorial is written for the benefit of those Unity users and explains how to set scriptData in a request, retrieve it in the response, and parse the data. 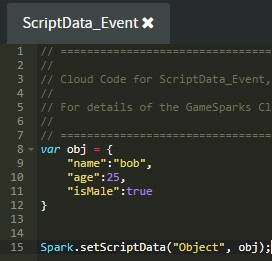 This section offers an example of how to parse different primitive data types from scriptData in Unity. 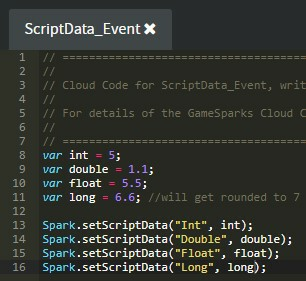 Each example shows the Cloud Code and the C# code in Unity. The Cloud Code setup is not explained in detail, because it should be pretty straightforward. 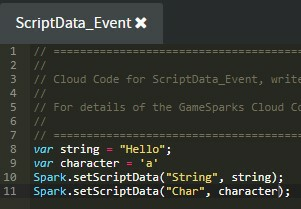 In these examples, you'll see that we've declared variables as var for some of the data types. This is just a shortcut declaration - if you don’t use var, you'll need to cast your returned data as the data type you require. This is done in the Numbers section below. For numeric values, depending on the number type, you use the corresponding Getter. For example, if you want a double value, you'll need to use GetDouble(), and so on. Long’s round numbers to their nearest whole number, so if you use a decimal number, it will convert it to closest whole number. 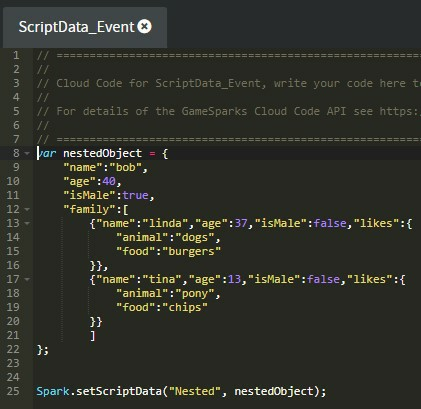 In this section, we'll cover more advanced data types, which are JSON objects and arrays. Each have a few more steps which combine the Getters for the primitive types. 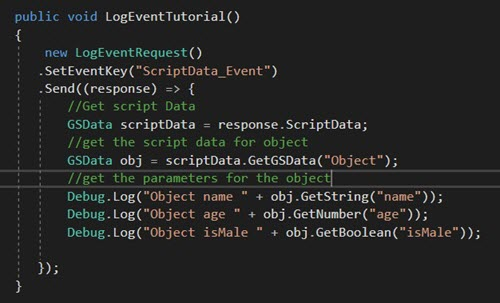 In Unity, we start with getting the entire object and storing it in a variable obj. 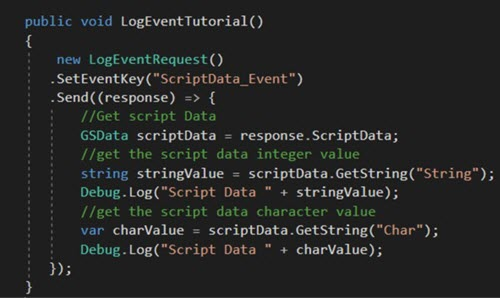 This contains the entire JSON object. For the next step, we want the family. The family is a list of objects, so we can store these into an object called familyList using GetGSDataList. 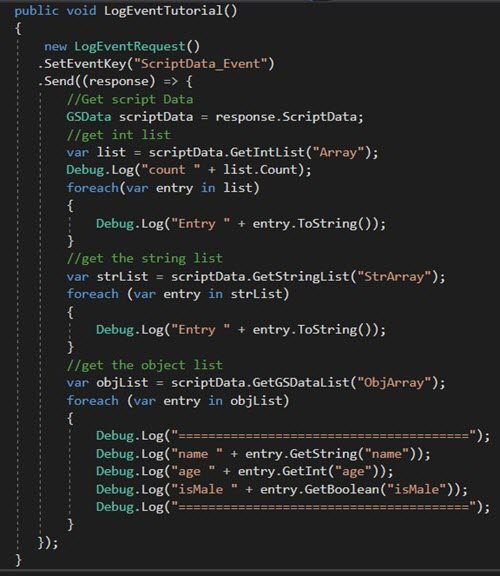 Next, we need to iterate through the list and extract the likes, which is another JSON object so we use GetGSData. 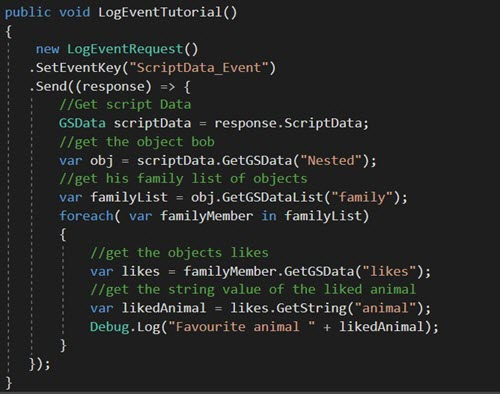 Finally, we can get the value of the animal that each family member likes which is a string so we use GetString.